Every February, we celebrate Black History Month and the many vital contributions African-Americans have made throughout history. This year's national theme, Black Migrations, highlights the movement of some 6 million people of African descent across the United States, where they created vibrant new communities and cultural experiences. We celebrate those paths forged by our parents, grandparents, and cultural forebears as a quintessentially American experience — a distinct slice of the human tapestry that has shaped our national identity and reminds us all that our stories and lives matter. From the late 19th to mid-20th century, the political and socioeconomic makeup of the United States changed as African-Americans left southern farms and cities to relocate to northern, midwestern and western urban centers. They were searching for improved living conditions and economic opportunities and seeking respite from the constant threat of racial violence and oppression created by Jim Crow laws in the South. During this "Great Migration," many African-Americans put down new roots in the commonwealth or pushed further north into New England and Canada. Black-owned businesses, including newspapers, emerged to serve these burgeoning new communities. 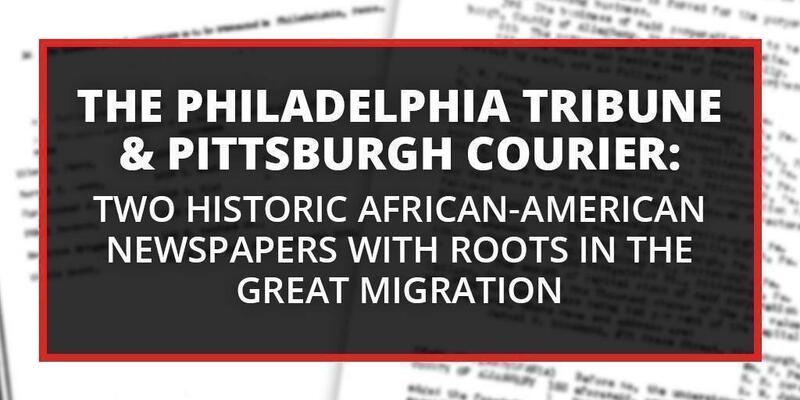 The Department of State, record-keeper of all business registrations in Pennsylvania, has the registration documents for two of the oldest and arguably longest-running African-American newspapers. They were both founded by southern migrants and continue to serve thriving African-American communities in Philadelphia and Pittsburgh. The Philadelphia Tribune was first published in 1884 and is the oldest continuously published African-American newspaper in the country. It was founded by Christopher James Perry Sr., who migrated from Baltimore to Philadelphia after graduating high school, in search of more opportunity above the Mason-Dixon line. After 10 years of working as a newspaper writer, editor and columnist, Perry lost his job when the Sunday Mercury declared bankruptcy. He decided at age 28 that he wanted to be his own boss, so he founded the Tribune, with offices at 725 Sansom Street. Perry served as the paper's publisher, editor, reporter, proofreader, advertising manager and sales representative. Relatives of Philadelphia Tribune founder Christopher J. Perry Sr. filed the newspaper’s business registration documents in December 1922. The paper's content included local, national and international news. Civil rights activist W.E.B DuBois noted that "the paper represents pluck and perseverance on the part of the publisher." Perry advocated in his paper for the advancement of African-Americans. He crusaded for better jobs, improved working conditions and black representation in city government. He wanted his newspaper to be a source of information and inspiration to his fellow migrants from the south as they adjusted to life in their adopted city. After Perry's death in 1921, G. Grant Williams became the publisher. A year later Williams died and Eugene Washington Rhodes, Esq., Perry's son-in-law and a graduate of Lincoln University, took over the paper. Today the award-winning Tribune is published five days a week and has a website at www.phillytrib.com. The Pittsburgh Courier was published from 1907-1966 and relaunched as the New Pittsburgh Courier in 1967. The original two-page Courier was founded by Edwin Nathaniel Harleston, a self-published poet who worked as a guard at the H.J. Heinz Company food-packing plant in Pittsburgh. He named the paper after the Post and Courier, his hometown newspaper in Charleston, S.C. By 1909, the Courier was four pages with a circulation of 500 readers. In early 1910, attorney Robert Lee Vann drew up the paper's incorporation documents. He then came on board as a writer. In late 1910, Harleston left the paper and Vann took over as editor until his death in 1940. Vann had migrated to Pittsburgh from North Carolina after winning a scholarship to attend the Western University of Pennsylvania, now the University of Pittsburgh. While earning both his undergraduate and law degrees from the university, Vann served as the first African-American editor of the school newspaper. He would later be appointed the first African-American assistant attorney general under Franklin D. Roosevelt in 1935. Pittsburgh Courier’s first two publishers are listed in the paper’s original business registration documents, dated June 1910. The "Local News" section of the Courier covered the lives of the upper- and middle-class residents of the predominantly African-American Hill District, with accounts of vacations, marriages and parties of prominent families, as well as the activities of social groups such as the Pittsburgh FROGS (Friendly Rivalry Often Generates Success). Sports coverage focused on African-American leagues, sometimes to the exclusion of white sporting events in Pittsburgh such as the 1927 World Series. Vann attracted controversy — and 10,000 new readers — by hiring George Schuyler in 1925, whose conservative editorials and opinions made him famous as the "black H.L. Mencken" and drew the ire of such contemporaries as writers Langston Hughes and Alain Locke. The Courier advocated for social progress, covering the injustices perpetrated on African-Americans by the Pullman Company and supporting the Brotherhood of Sleeping Car Porters. Vann wrote in favor of improved housing conditions in the Hill District and better education for black students, while editorializing against racial discrimination in the drafting and training of African-American men in the armed forces. By the 1930s, the Courier had become one of the most widely read and influential African-American newspapers in the country, with more than 400 employees in 14 cities. Columnists included W.E.B. DuBois and Pan-Africanist Marcus Garvey. The paper reached a circulation high of 357,000 readers in 1947. In 1966, publisher John H. Sengstacke bought the newspaper and re-named it the NewPittsburgh Courier. In 1974, Sengstacke appointed Hazel B. Garland as the paper's new editor-in-chief. She was the first African-American woman to serve as editor of a national newspaper. Her family had also migrated to Pennsylvania; they moved from Indiana in the early 1920s. Today the award-winning Courier is owned by Real Times and is published every Wednesday. It has a website at www.newpittsburghcourieronline.com. During the rest of Black History Month, I encourage you to seek out more inspirational stories from The Great Migration in museums, books, news articles, documentaries and films.